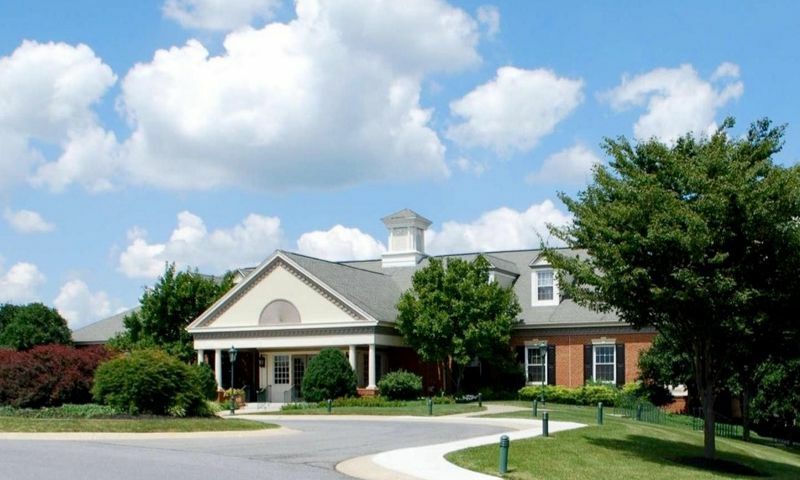 Villas at Cattail Creek is a 55+ community in Glenwood, Maryland. This active adult neighborhood is adjacent to Cattail Creek Country Club and enjoys picturesque views of the golf course. Villas at Cattail Creek offers unique home designs such as attached residences or single-family homes that cater to active adult homebuyers. Residents live a carefree lifestyle thanks to an established homeowners' association (HOA) that handles tedious exterior home maintenance. Villas at Cattail Creek also promotes a vibrant and welcoming environment where residents have well-appointed amenities and participate in a variety of organized events and activities. Residents of the Villas at Cattail Creek enjoy a charming clubhouse with great indoor and outdoor amenities. The multi-purpose room is the perfect place to hang out with friends, play cards and games, or attend a community event. Homeowners explore their creative side in the craft room or catch up on the latest novel in the library. A catering kitchen is available to prepare a quick snack or meal for a party. Outdoors, residents enjoy the neighborhood's walking and biking trails for leisurely strolls or brisk jogs in the morning. They can also appreciate picturesque views of the lush landscape, adjacent golf course, and natural surroundings in this active adult community. Villas at Cattail Creek was developed between 2004 and 2006 by prestigious builders NV Homes and Ryan Homes. Active adult homebuyers have a great selection of townhomes and single-family homes from which to choose in Villas at Cattail Creek. All homes have first-floor master suites and most come with full basements, second floors, and private balconies or patios. Homeowners will also enjoy scenic vistas of the beautiful golf course, open fields, and rich landscape. NV Homes built 68 townhomes in Villas at Cattail Creek. These attached residences offer approximately 2,200 to 2,931 square feet of living space. They have three bedrooms, two-and-a-half or three-and-a-half bathrooms, and an attached one or two-car garage. Home interiors feature first-floor master suites, gourmet eat-in kitchens, tray ceilings, crown molding, and recessed lighting. Ryan Homes built 25 single-family homes that range in size from approximately 2,000 to 4,700 square feet. These detached residences have two to four bedrooms, two to three-and-a-half bathrooms, and an attached two-car garage. Homebuyers will love the open concept layouts, brick exteriors, luxurious first-floor master suites, high ceilings, hardwood on the main floor, gourmet kitchens, main level laundry rooms, and full basements. An HOA fee takes care of snow and garbage removal, lawn care, exterior home maintenance, and clubhouse upkeep. This gives residents more time to live a vibrant lifestyle. Villas at Cattail Creek promotes a social and active environment for all of its residents. The community features organized events, clubs, and hobbies that are sure to please active adults. Homeowners can join the book club or craft circle, play canasta, make arts and crafts, or attend picnics to socialize with neighbors. Villas at Cattail Creek also offers organized events like holiday parties, movie night, or happy hour as well as day trips to theater shows and museums. Ideally situated in Glenwood, MD, Villas at Cattail Creek enjoys a prime location that's close to everything active adults want or need. Right next door is Cattail Creek Country Club. It offers multiple membership options where residents can play a round of golf and tennis or dine in the restaurant. Access to Interstate 70 and Highway 32 are close by for getting around town. Just a few miles away are plenty of dining and shopping options as well as outdoor recreation like Glenwood Park and Warfields Pond Park. For big-city attractions and entertainment, Baltimore is about a 40-minute drive. Catching a flight out of Baltimore/Washington International Airport is also easily accessible. Active adults will love the low-maintenance homes and welcoming environment throughout Villas at Cattail Creek in Howard County, Maryland. There are plenty of activities available in Villas at Cattail Creek. Here is a sample of some of the clubs, activities and classes offered here. Ryan Homes built 25 single-family homes that range in size from approximately 2,000 to 4,700 square feet. These detached residences have two to four bedrooms, two to three-and-a-half bathrooms, and an attached two-car garage. Homebuyers will love the open concept layouts, brick exteriors, luxurious first-floor master suites, high ceilings, hardwood flooring on the main floor, gourmet kitchens, main level laundry room, and full basements. Great community. Active and fun. 55places.com is not affiliated with the developer(s) or homeowners association of Villas at Cattail Creek. The information you submit is distributed to a 55places.com Partner Agent, who is a licensed real estate agent. The information regarding Villas at Cattail Creek has not been verified or approved by the developer or homeowners association. Please verify all information prior to purchasing. 55places.com is not responsible for any errors regarding the information displayed on this website.